The crash closed down Country Road 54 Sunday evening, the Florida Highway Patrol said. Alcohol was not a factor in the crash. 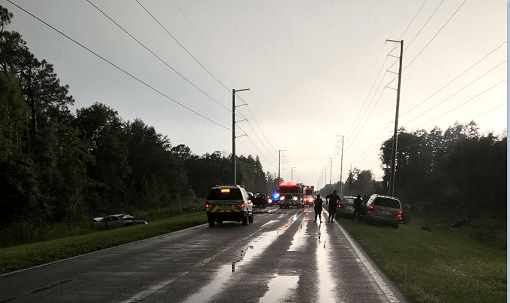 PASCO COUNTY – A two-vehicle head-on crash on County Road 54 left three people dead Sunday (Aug. 19), the Florida Highway Patrol said. Elvin Michael Benitez, 30, of Zephyrhills; Dennis George Wilkes, 38, of Lakeland; and Chrisstina A. Farmer, 27, of Winter Haven, all died at the scene. Mr. Benitez was not wearing a seat belt. Ms. Farmer was a passenger in Mr. Wilkes’ car. John Arel, 11, and Jasmine Benitez, 6, both of Zephyrhills, who were passengers in Mr. Benitez’s car, were seriously injured. John was taken to Lakeland Regional Hospital. Jasmine was taken to Tampa General Hospital. The crash, which happened about 7:08 p.m. on CR 54 west of Berry Road, closed the roadway to traffic in both directions. Troopers said Mr. Benitez was driving a 2015 Mazda6 west on CR 54 west of Chantel Drive. Mr. Wilkes was driving a 2005 Toyota Camry east. Mr. Benitez drove into the eastbound lane to pass other traffic and collided head on with the Toyota, FHP troopers said. After the impact, the Mazda was propelled to the south shoulder of the road where it overturned. Troopers said Mr. Benitez was thrown out of the car. The Toyota was also propelled to the south shoulder where it hit a wire fence before coming to a rest. Photos and map courtesy of the Florida Highway Patrol. The crash closed down Country Road 54 Sunday evening, the Florida Highway Patrol said.